GST refunds, unless expedited, would be an additional dampener for exporters to sail through in 2018-19 and sustain the almost double-digit growth achieved in the last fiscal. Merchandise exports hit a three-year high in 2017-18 but slowing growth in shipments of manufacturing goods and raw materials, collateral impact of a global trade war, unfavourable base effect for roughly half the year and temporary discomfort to traders due to last month’s ban on the widely-used letters of undertaking (LoUs) pose risks to export growth in the current fiscal year. Manufacturing export growth eased to 4.1 per cent year-on-year on a three-month moving average basis in March, against 8.3 per cent in February, while expansion in farm exports contracted by -3.1 per cent from 2.3 per cent while growth in other commodities (mostly raw inputs) continued to decelerate, according to an estimate by Nomura. Within manufacturing exports, while engineering goods performed better in March than the previous month, drugs and pharmaceuticals, electronic goods and garments moderated while gems and jewellery registered an even sharper contraction in growth compared with February. Overall, goods exports dropped 0.7 per cent in March from 4.5 per cent in the previous month. Partly driven by an unfavourable base, the sequential contraction in exports in March comes at a time when the blockage of working capital due to delayed GST refunds, ban on LoUs and letters of comfort (which could hit trade temporarily with a lag) and rising oil prices have threatened to undermine India’s already fragile export competitiveness. A looming trade war between the US and China and resultant uncertainties in global trade growth just heightens the risks for Indian exports. The World Trade Organisation (WTO) has forecast trade growth at 4.4 per cent for 2018, down from 4.7 per cent in 2017. Although the IMF has raised its trade growth by 50 basis points for 2018 from an earlier prediction, it has flagged risks from protectionism. “We expect the current account (CA) deficit to widen to 2 per cent of GDP in 2018 from 1.7 per cent in 2017 (given the domestic cyclical recovery and elevated commodity prices). The basic balance of payments is already negative, making funding vulnerable to global risk sentiment,” Nomura said. According to Nomura, only Rs 3,000 crore of the Rs 13,000 crore of GST refunds have been cleared. Exporters continue to struggle with working capital as GST refunds remain unprocessed. “Indian trade remains vulnerable to global trade tensions, as the US is India’s largest export market, and China is its largest import partner. Finally, rising oil prices will worsen the current account (CA) balance; every $10/bbl rise in oil prices deteriorates the CA by 0.4 per cent of GDP,” said Nomura. 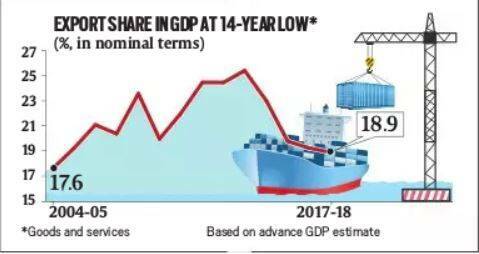 Even in services, with the high 20.3 per cent growth in exports being overshadowed by the sharp 40.2 per cent expansion in imports, the services surplus declined to a four-month low $5.6 billion in February 2018, according to Aditi Nayar, principal economist at ICRA.